After months of training and thinking about this crazy adventure the day finally came. 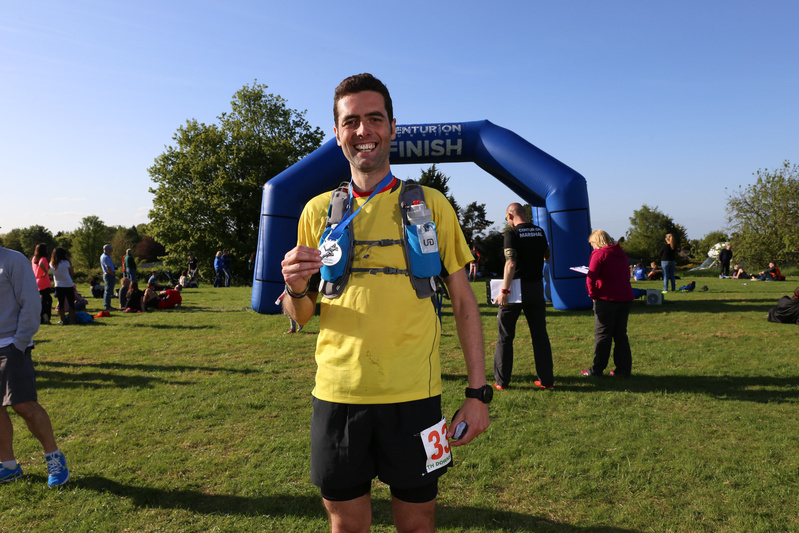 Saturday was race day, my first ultra marathon, the North Downs Way 50. I chose to try that particular race as it is quite close to home and I knew friends were doing it. Some people said it also was quite good for a beginner as the elevation gain is not too extreme. The day before the race was spent (half of it as I only took half day off) preparing the pack and spent with two friends from Italy who came to run the race, Davide (@unknowndest) and the man known as “Cinghiale”. We spent the afternoon discussing their various racing experiences and I kept on asking for hints and tips. I was pretty excited/scared. I checked for the final time the race pack and then we had an early dinner. I tried to go to sleep early but the excitement was too much. I slept very little and when the 4:30am alarm clock went off I was already awake. I had my usual pre-race breakfast (tea and two toasts, one with jam and one with peanut butter), spent a lot of time in the toilet (everything was going as planned), prepared the water bottles (one with just water for the race and one with salts for the pre-race snacks) and left the house. I picked up the two pros and off we went to Farnham. As usual (for me) we arrived super early for registration. The race pack check went very quickly and we had our bib numbers. 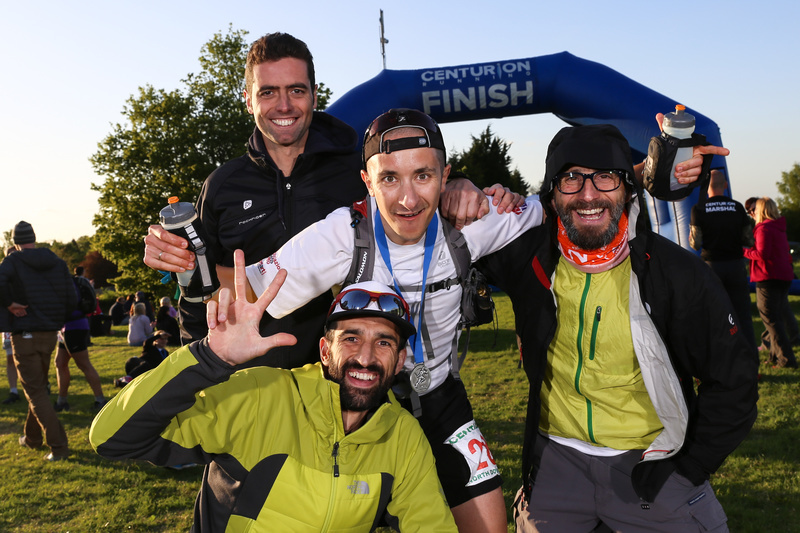 More waiting, chatting with people, more toilet breaks, a banana and energy bar, more waiting and then Emanuele (@manuontrail) finally arrived. I had been waiting to meet him for a long time. We sort of prepared this race together, from two different countries, via the power of the internet. It was time to see how ready we were. 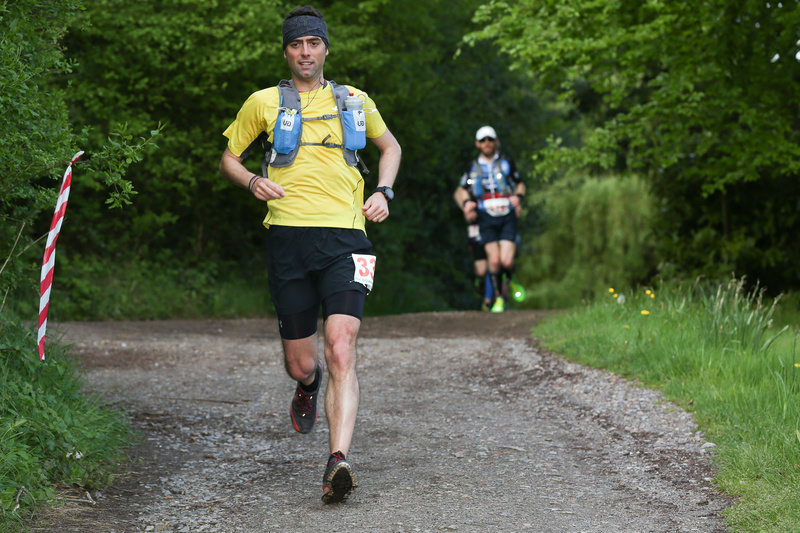 He had already run the SDW50 so at least he knew he had the distance in the legs, I did not. We walked to the start line and had a quick briefing from race director James and then boom, we started. My race plan was to take it easy and save energy in the first half and get to Box Hill still full of energy and then see what I could do in the other half. I had run 50k in training and I knew I still had plenty of energy at the end if I did not go too fast, so I planned to run at a pace just below 6:00 min/km. In my dreams I thought I could do the whole race at that speed, slow down uphill and make up time downhill. I was dreaming of finishing it in just a bit more than 8 hours. How wrong I was! Davide and Cinghiale disappeared in front straight away, like missiles. I ran 2k with Emanuele and then went on my own. My confidence was shattered pretty quickly. I realised straight away that it was going to be a lot harder and that I should have done more hill training (mistake number 1). By the 20th km I was already walking uphill and I was feeling as tired as at the end of a marathon! I realised I was not saving any energy for the second half. I was already burning everything to get to it! While I did not stop at the first aid station I did a quick stop at the second. Took one of the gels available there and had my water bottle filled again. The gel was a caffeine one and it worked quite well. I got into a rhythm. If going up was too hard I would walk and run the rest. I really struggled and started suffering even on flats and downhill. I kept telling myself that once I was at Box Hill and half of the race was done I would feel good and as a prize I would start listening to my mp3 player. I really was looking forward to the music. It became the reason why I wanted to get to Box Hill as fast as possible. I suffered like crazy going down the private vineyards road near Guilford (I cannot remember the name) and I was telling myself “if you are struggling going downhill in the first half of the race, what are you going to do in the next 50k?”. I arrived at the Box Hill’s aid station (24 miles) in 3:49 minutes. If I think about it now it was not too bad, but at the time I felt so tired it seemed like it took me ages. Fortunately the friendliness of the volunteers at the aid station helped a lot. They gave me more water and words of encouragement. I started eating different things from what was available. I really appreciated the peanut butter sandwich and loved the water melon. I left pretty quickly but very happy. The day was amazing, blue sky, sunny but not too hot. Plenty of people around cheering us, beautiful vistas from the hill tops, amazing single tracks in the woods. It was a perfect introduction to ultra running. I was halfway through. I felt tired, but happy. The river crossing on the stones and the water melon gave me a boost. I walked up the Box Hill steps thinking that they were not that hard and then started running again with an extra spring. I took out my mp3 player and all excited I told myself it was time to kick some asses. Mistake number 2: check the batteries work! Disaster, I had no music. I had to carry an mp3 player for no reason and I was not going to have any help from the music. I soon got over it and started running well. That was the best part of the race for me. I felt good. I ran quite fast where I could and walked pretty well uphill. I overtook a lot of people. Someone coming the other way told me I was in the top 50 and that gave me an extra boost. Even the killer Reigate Hill did not discourage me and I arrived at the next aid station (50k) quite comfortably. Unfortunately there was no water melon, ever again. I was definitely slower than my dream plan but not too bad. The GPS was playing tricks so aid stations arrived earlier than I expected, which was a bonus. I had more fruit from the station, some crisps and filled the bottle with an energy drink. Then the real trouble started. I had been very good at eating a gel every half hour, drinking a lot, a salt stick every hour and so on, but I probably did a mess at the aid stations. The more I got tired the more I started eating random stuff and drinking coke (mistake number 3), which is something I never do even in a normal situation as I get terrible hiccups. So I started having nausea and belly cramps and really struggled running. I alternated a quarter km walk with 1 km run, but I was getting slower and slower and when I realised I still had hours, probably more than 4, to go I had a real low patch. There were some bits on the road that seemed endless, I remember a very bad bid in the middle of a golf course and then between houses. It seemed infinite. I would have lost the path at some point if a lady with a pram had not shouted me where I had to go. I was spent. The legs were hurting, but the real problem was the belly. At the Caterham’s aid station (61k) I did the biggest mistake, I had ice cream. Disaster. 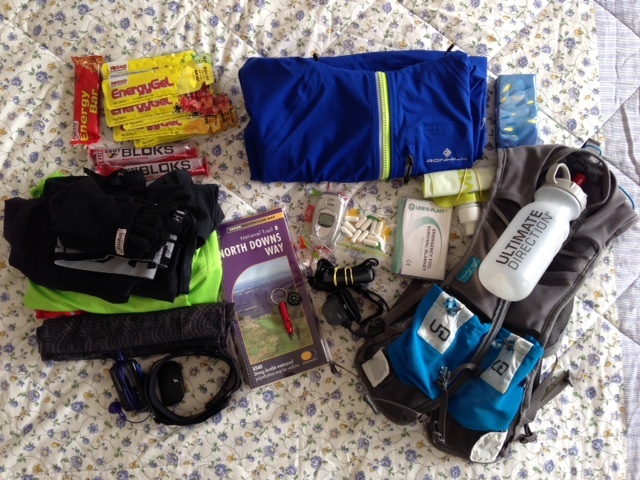 The belly problems got worse and finally I had to stop and hide behind a bush and … But then I felt a lot better and when I got to the last aid station I started thinking about the end. I was going to make it! The nice volunteers made me a hot tea and it went down so well I was almost in tears with happiness. The next 12/13k went a bit blurry. I kept on running where I could and walking were I could not, including downhill, which had become a pain. A guy in front of me was even more in pain and did the downhill steps backwards. The GPS was unreliable so I could not know if I was almost there or not. A 2k difference at that point seemed a lot. Then there was an endless stream of potato fields. They never ended! Luckily it was all flat and as it was almost the end I started smiling inside. I went into machine mode. I was talking to myself loudly, counting the step, 1 to 10 and then again 1 to 10. I became louder but I kept running. I overtook people (that probably thought I was crazy), but I kept going. The legs where almost to the point of explosion (funnily I never had any cramp, which was my most feared scenario), the knees wanted to come off, but the belly was under control. At some point I entered another potato field and saw the finish balloon at the other end. I could hear people screaming, but the path was not taking me there. Painfully there was still one mile to run around the field and then in the village of Knotholt. But finally I saw it in front of me and people started cheering, I saw my super fast friends there waiting for me (they had finished in 3rd position together, heroes), shouting, I had to resist the temptation to cry. I was so happy when I crossed the line. An indescribable feeling, 10 hours and 1 minute. If you put together all the happiness I felt at the finish lines in my 40+ half marathons and marathons you do not get even close to what I felt Saturday. It had been an amazing day. Amazing people, weather, location, pain, happiness, self discovery etc. I sat on the grass, in the sun, with my medal and everything was perfect. While waiting for Emanuele I had a sausage sandwich and a recovery drink and felt like new. I checked my phone and found many many messages from friends and family that had been following me on the live website. It was very nice to know people had been thinking about me all day. We took the bus back to Farnham (wonderful organisation by Centurion by the way) and we had a fish and chip dinner. I could not eat much due to a killer hiccup that had finally got hold of me. I did not even sleep much during the night, too much adrenaline and hiccups. We spent the next day in the pub, in front of beers and a Sunday Roast reminiscing the events of the day before. Then it was time to say good bye and I finally felt very tired. By 9.30pm I was sleeping in bad. If you are interested, the official results are here. My Strava of the race is here (but my watch lost 2km somewhere). Thanks to everyone who helped during the day. You made it special.